With Chivas and Puebla even at 2–2 late in added time, 22-year-old Chivas winger Carlos Fierro went into ninja stealth mode. 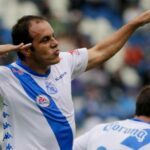 He lurked behind Puebla goalkeeper Cristian Campestrini and as soon as Campestrini dropped the ball on the ground, Fierro pounced. He swiped the ball and had Campestrini crawling on his hands and knees after him like a toddler on a frozen lake. 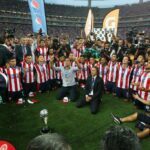 Fierro scored with relative ease, giving Chivas a 3–2 win. This was his first goal of the season. Campestrini, meanwhile, must now change his name, dye his hair and take up a new profession. One where he can keep his back to a wall at all times to ensure that no one can ever sneak up behind him again. This is how lifelong paranoias are born. He might even start wearing a helmet with rearview mirrors attached to it.